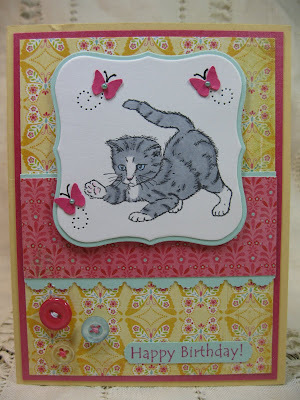 Today I have another card for you using the new Theresa Momber set called Purrr-fectly Delightful!! You can purchase it at Gina K Designs. I know I've said it before but I just "LOVE" this set!! Hope there will be a second edition someday!! :) You can see more awesome cards made with this set on Gina's blog. Thanks for stopping by and have a purrr-fectly wonderful day! Taylored Expressions Sketch Challenge ~ perfect sketch for using buttons!! I love this!! Who doesn't love a kitty! The butterflies are the perfect touch. Thanks for joining us this week at FBW! Beautiful colors and idea for the card!! Awesome! Thanks for fluttering with us this week! How darling!! Super cute! Thanks for playing along with my flutter by challenge!